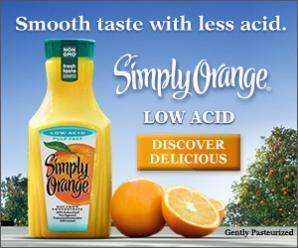 Simply Beverages uses never-from-concentrate juices in all of their beverages. And they never add any preservatives, colors or artificial flavors. In the end, Simply Juices and Juice Drinks taste so refreshing and delicious because they never forget that Nature is the most important part of our story. Read our bloggers’ posts and find fun beverage recipes you can serve this summer! Plus get a chance to win $100. Simple Summer Joys Sweepstakes on BlogHer runs from 6/6/16 through 9/5/16 and is only open to individuals who, at the time of entry deadline, are legal residents of the United States and are 18 years or older. Click "here" to read the official rules. Winners will be randomly selected from all eligible entries. Good luck! Simple Holiday Joys Sweepstakes on BlogHer runs from 11/21/16 through 12/31/16 and is only open to individuals who, at the time of entry deadline, are legal residents of the United States and are 18 years or older. Click "here" to read the official rules. Winners will be randomly selected from all eligible entries. Good luck!